Brian, Becky, and Ben developed the idea of self-storage in 2002, converting 14 acres of farm ground to a storage facility. 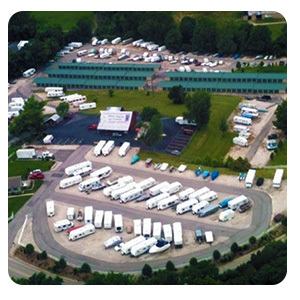 Self-storage expanded into outside storage when their neighbors needed a place to store their boats, and within a few years, we are proud to say we became the largest boat, trailer, and RV storage facility in the state! 2002- Opened with 110 storage units and 150 outside parking spaces. 2004- Expanded to 210 storage units and 250 outside parking spaces. We’re a family of dedicated professionals , ready to do whatever it takes to serve our customers – daily. I have spent all of my life in the St. Louis area and was raised in High Ridge, where I attended high school at Northwest. My wife and I met at Southeast Missouri State and got married in 1979, started a family, and started a cleaning service business in 1983. My other passions besides my family and business include getting involved in local politics and community projects. I have served for multiple years as a board member of the Missouri Self-Storage Association. Also, I was elected and served on the Northwest R-1 school district board from 2009-2012, as well as the High Ridge Fire Protection district board from 2009-2015. I was born and raised in St. Louis and have spent all of my adult life here. Brian and I got married in 1979 and have 4 amazing children together. I was a stay at home mom for most of our kid’s adolescent years. After our kids got older, my involvement in our cleaning and landscaping business grew. Once we opened the storage facility, I became very involved in day to day operations of the business. Outside of work, I enjoy spending time with my kids and grandchildren. My pursuits in education included accounting and finance, but as time went on I became more interested in investing time in my parents business. I have been working for my parents since the age of 14 and full-time since 2003. My main responsibilities consist of outside maintenance and office duties. I have been living at the facility since 2006, providing enhanced security and customer service to all of our customers. My other hobbies include endurance sports and farming. I was inspired by my sister, Sarah, after she encouraged me to run a mile with her in Colorado. We ended up running an 8 minute mile together and since then, exercise became a part of my lifestyle. Since 2010, she has inspired me to lead a healthier path in life which led me to meeting Jen, my wonderful partner in life. My other passion is raising plants and animals for food, which includes cows, chickens, turkeys, and a vegetable garden.